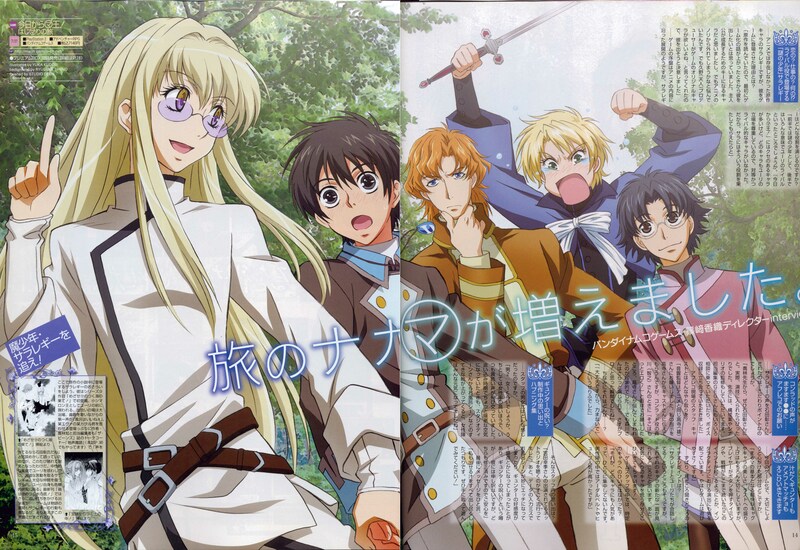 This is a scanning of monthly Newtype Romance Summer 2006 issue. The name of blond man who wears glasses is Sararegi. Akira Ishida is taking charge of the character voice. The Nagisa Kaoru post of NEON GENESIS EVANGELION is known. It is uncertain whether he appears in the animated cartoon. I'm taking that blond guy with the glasses is from the game... or will he appear in the anime too? I LOVE Kyou Kara Maou! Thanks for sharing this beautiful scan. :D I don't remember seeing the blond guy (the one wearing glasses) before, but he's very good-looking! I really recognized the artwork of this picture and when reading "Studio Deen" bellow it, I prompty remembered from where: Fruits Basket! Those boys really look like Furuba boys! They are very cute indeed! Stuido deen art is so nice! So light and colorful! :) I enjoy it!Thanks for sharing! Thats so cute I've only seen the first 8 episode of it though. ...there's a game? There better be because I haven't seen that cute blonde and i watched the whole series! I pray for an OVA. Hahaha... this is sooooooooo cute... especially wolfram goin all jealous over yuri n sara 2gether... this is season 3 of kyo kara maoh rite? hehe, angry wolfram is angry.